"The 2015 Gevrey-Chambertin "Ostrea" comes from three parcels on unique fossil-rich limestone soils. It has a very composed and harmonious bouquet: joyful blackcurrant and raspberry fruit, hints of orange sorbet and orange rind emerging with time in the glass. The palate is medium-bodied with very fine tannin. There is real succulence here, hints of blue fruit lending it an almost Marsannay-like character towards the terroir-driven, mineral-led finish. This is excellent." "Bright, dark red. Reticent, slightly musky nose hints at red berries and animal fur. A step up in richness and breadth from the regular village wine, with harmonious acidity giving the wine excellent vinosity. Plum, cherry and game flavors carry through to a persistent finish featuring supple, dusty tannins." "Outstanding top value. This is aromatically similar to the straight Gevrey cuvée with the exception that it is even more floral-suffused. There is a beguiling sense of energy to the beautifully well-detailed medium-bodied flavors that are more mineral-driven on the racy, dusty, sappy and impeccably well-balanced finale. This is an excellent Gevrey villages though note that it will require at least some patience as it's presently quite firm. Recommended." 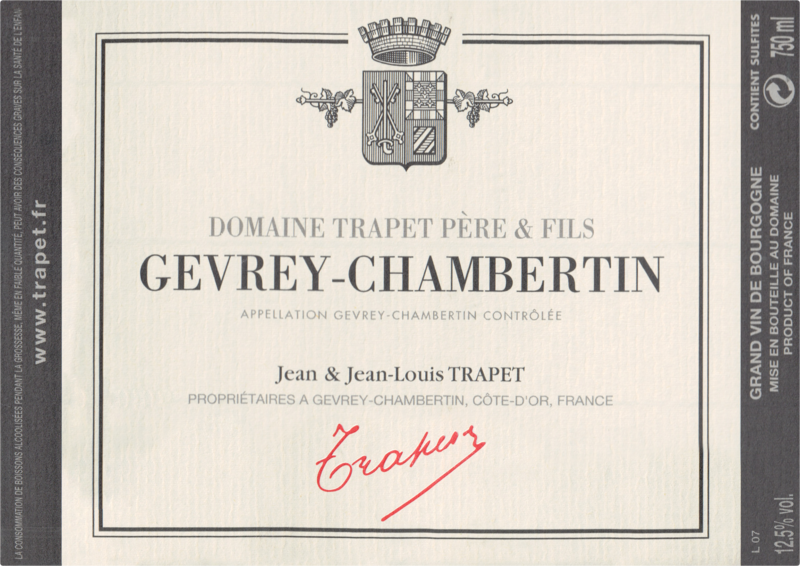 "Domaine Trapet Père et Fils is one of the greatest estates of Gevrey-Chambertin, with superb holdings in three of the top grand crus in the village and a legacy of great wines that dates back to their earliest days of estate bottling. While the family have been important vineyard owners in Gevrey-Chambertin since 1870, it was not until the 1960s that they began to bottle a majority of their production and offer their wines directly for sale to clients. Previously they had been one of the finest sources for top négociants in the region, including Maison Leroy and Maison Joseph Drouhin. By the late 1920s, Domaine Trapet had become one of the most important vineyard owners in all of Burgundy, as they were the single largest owner in the great vineyard of Chambertin at this time, as well as owning very large tracts of Latricières-Chambertin and Chapelle-Chambertin. The domaine was known throughout much of its history as Domaine Louis Trapet, named after the founder, but in 1993, the estate’s vineyard holdings were split in half, as a new generation sought to make wines from their half of the family’s holdings. The result was the Louis Trapet estate being renamed as Domaine Trapet Père et Fils and run under the very sure hand of Jean-Louis Trapet. As was the fashion at many top estates in the 1990s, Jean-Louis used quite a bit of new wood for his top wines at that time, but has moved to using dramatically less starting in the early 2000s and is now making some of the greatest wines in Burgundy today. The vineyards have been fully farmed under biodynamic principles since 1996, and are 100% certified biodynamic as of 2009. While the estate is best known for its three great grand crus, the quality at Domaine Trapet Père et Fils is simply outstanding up and down the hierarchy of their vineyard holdings. Their Bourgogne rouge is one of the best in Burgundy. The domaine also makes an outstanding example of Gevrey-Chambertin Villages, and an impressive lineup of premier crus to augment their portfolio. The domaine also owns parcels in three top premier crus: Clos Prieur, Les Corbeaux and Petite Chapelle. The Clos Prieur and Petite Chapelle plots are amongst the first that the Trapet family purchased in the late 19th century. They purchased Petite Chapelle in 1877, followed by Clos Prieur in 1893; the Trapet les Corbeaux parcel was purchased much more recently. Because these plots are relatively small, in vintages with tiny yields they are sometimes combined to make a wine named "Cuvee Capita 1er Cru". Their outstanding bottlings of Grand Crus (Latricières-Chambertin, Chapelle-Chambertin and Chambertin) are crafted to really show off their underlying terroirs. Though they may not be as "big" or powerfully constructed as some of their other more flashy neighbors in the village, in terms of aromatic and flavor complexity, expression of terroir, and aging potential, Jean-Louis Trapet is certainly in the top eshelon of producers wines in Gevrey-Chambertin. Like the man himself, there is an elegence, grace and purity to the wines that is haunting and rare in Gevrey. He is again creating the soil-driven and absolutely pure wines of his father and grandfather’s era. 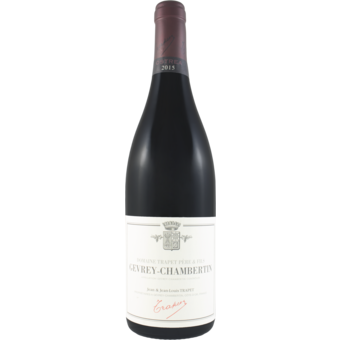 These are aristocratic interpretations of some of Gevrey’s greatest terroirs, with an emphasis on pure red plum and black cherry fruit, notes of grilled meat, cocoa powder, lovely soil tones and a judicious framing of new wood. The Bourgogne rouge and Marsannay will usually drink well when young, while the Gevrey AC can use a year or two to blossom and ages very well. Of the three premier crus, the Corbeaux is pure red fruit, spice and lovely soil tones, the Clos Prieur more black fruity and meaty in style and the Petite Chapelle one of the most elegant, deep and complex premier crus to be found in Gevrey. The Selectionées Capita bottling takes the best attributes of Clos Prieur and les Corbeaux and synthesizes them into a whole greater than their parts, and the three grand crus are pure magic. All in all, Domaine Trapet Père et Fils is today at the top of their game and Jean-Louis Trapet is fashioning wines that are as stunning as any in the great history of this long-time Gevrey superstar.